Super 8 to DVD transfer. 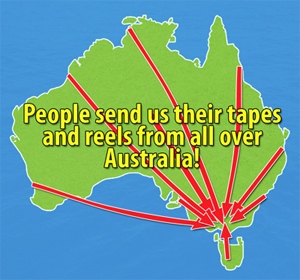 Melbourne, Adelaide, Hobart, Darwin, Perth, Brisbane, Canberra, Sydney & the rest of Australia! Get your Super 8 film converted to DVD, USB or Hard Drive today! Our Regular 8 and Super 8 film transfers are completed using brand new state of the art frame by frame film scanning technology. Every single frame of your film is captured separately and then a flicker free colour enhanced movie is created. PhotoQ will look after your 8mm film like it’s our own. Our technicians will carefully clean your reels and check them for damage before we start the transfer and resplice any bad joins where necessary. Our high definition frame by frame scanner is belt driven so even damaged sprocket holes are no problem. Our technicians monitor your film as it transfers and adjust for colour, density and sharpness. We can even offer Standard 576p or High Definition 1080p files saved to your hard drive or we can provide a hard drive for you. Dont have your films transferred using the old telecine method, in the last 2 years the film scanning technology has significantly improved and as a result you can expect much better results. We have a per reel fee and have no extra hidden charges, other transfer business have set up fees and then a per foot fee and extra for sound! We will clean and resplice your film as required with no additional charges. If your film is literally falling apart then we may quote you to rectify this but this is quite rare. Why not get them put onto DVD disc, file or hard drive and share them with friends and family? Our high defintion frame by frame film scanner is belt driven so even broken sprocket holes are not an issue. Our system also incorporates LED lighting so there are no hot lamps which can burn holes in your precious films. Our techinicians will adjust your films to achieve the best colour and density in real time! If you would like to know how much it costs to have your Super8 reels transferred to DVD, or a digital file please call PhotoQ on 03 9855 0006 to get a quote. We don't just transfer Super 8 reels to DVD. We can also transfer your old 8mm, 9.5mm, 16mm reels to DVD disk, computer file, hard drive or Blu-ray Disk. We also transfer Slides, negatives and prints to CD! We also transfer VHS, VHS-C, S-VHS, Beta, 8mm, Hi8, Digital8 and Umatic tapes. What if I am not near Melbourne? If you are not near Melbourne don't despair. Just download, print and fill-in our DVD transfer postal order form below and send it to us with your tapes or reels via Express or Registered Post and leave the rest to us. We will ring you when we receive your order to let you know it has arrived safely and arrange payment. You may also include a self-addressed Express Post bag with your order to avoid a postage and handling fee. Please note: Please do not send us copyright material to transfer to DVD unless you are the copyright holder (proof will be required) or have written permission from the copyright holder (this will be required with your order also).